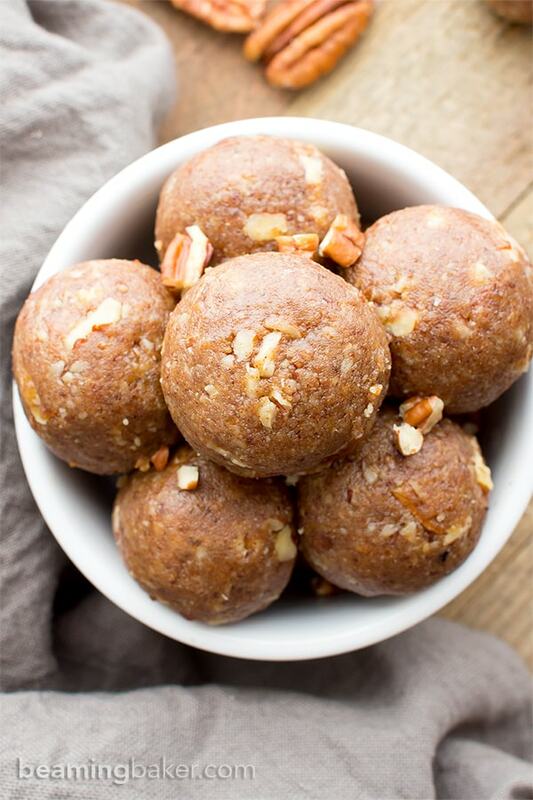 No Bake Vegan Pecan Pie Bites (Paleo, V, GF): a 5 ingredient recipe for deliciously fruit-sweetened no bake bites bursting with pecan pie flavors. Paleo, Vegan, Gluten Free, Dairy Free. Anywho, Thursday means we’re that much closer to the weekend. 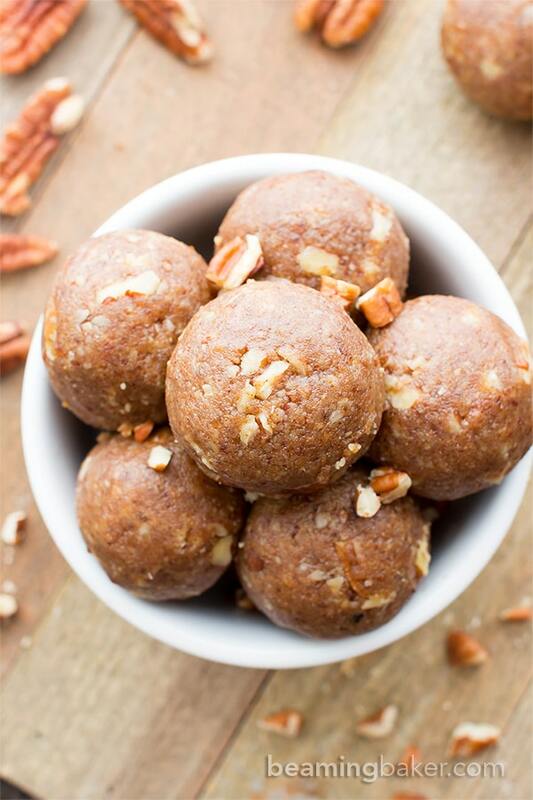 And Thursday is kind of the day where we get all rambly and start losing track of our thoughts… and totally forgetting about our no bake vegan pecan pie bites and such. So that probably means it’s in all of our best interests to call off the rest of the week. What do you think? Well, when I got to whipping up those brownies, I got to snacking on all of the delicious pecans. Do you have a thing for pecans? I really, really do. 🙂 Can you tell I’m in the mood for song and dance? <– This is what the impending weekend does to me. The thing is, pecans are so, sooooooo good. 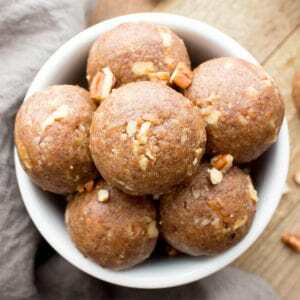 Even when you eat them just as is, they taste like they’re coated in coconut sugar, or brown sugar or maple syrup—basically coated in all of the delightful sweet-tooth-craving things. I spent years trying to convince Erik as such. And guess what? I did it!!! Yay!!! Did I tell you? He totally used to loathe (yes, loathe) any sort of nuts in his dessert (I know). He just didn’t think it was right. I quickly dispelled him of that notion. And by quickly, I mean it only took 7 years and 6 months plus 29 days of convincing. He’s a tough nut to crack. Ironically. Anywho, Erik absolutely LOVED the double chocolate pecan brownies. After he ate one, or perhaps even three, he started jumping around the house and spouting off a bajillion ideas for what I should make next. Of course, all of his ideas were the very epitome of pragmatism. Think: quadruple chocolate pecan pie tower made up of 200 mini pecan pies with chocolate filling, plus chocolate topping, chocolate shavings and chocolate shell. I don’t even know where the shell was supposed to go, but that’s “neither here nor there” according to Erik. There were a lot of other perfectly reasonable ideas involving pecan floats (not ice cream, but parade), pecan layer cakes shaped into one large pecan that would somehow also be floating, anti-gravity style, and an entire pecan shortbread village made up of pecan people with pecan hats. No floating there for some reason. And as I nodded along and assured Erik that yes, one day those ideas might be feasible when I multiplied into seven more people (possibly all wearing pecan hats), for now, I’d like to do something simpler. He wasn’t too pumped about the idea of putting off his awesome pecan ideas, but he understood. Ish. Meanwhile, on the “less” practical side (according to Erik), I wanted to create a recipe that had all the flavors of pecan pie while also being super duper easy to make. 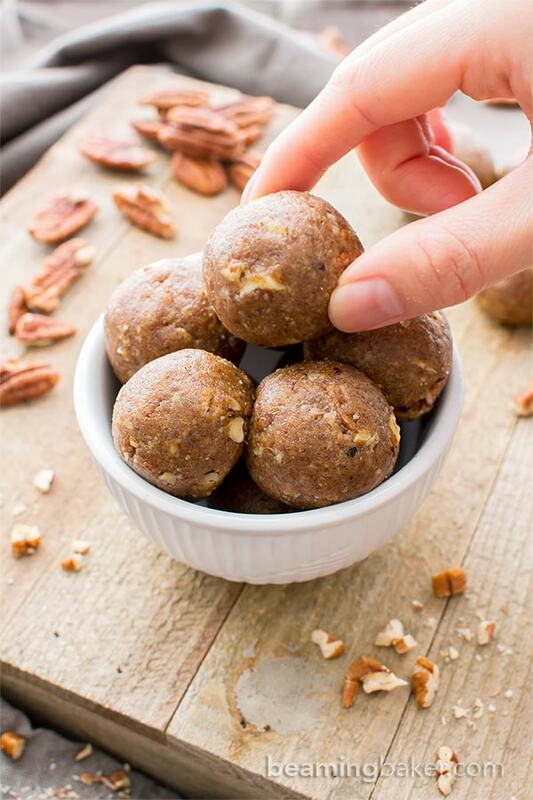 Et voilà: No Bake Vegan Pecan Pie Bites. 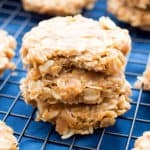 Yes, I totally understand that some of you may be disappointed by the fact that these no bake bites don’t include any floating elements whatsoever. Feel free to join Erik’s support group—he’ll be creating a signup sheet as soon as he stops bouncing off the walls. 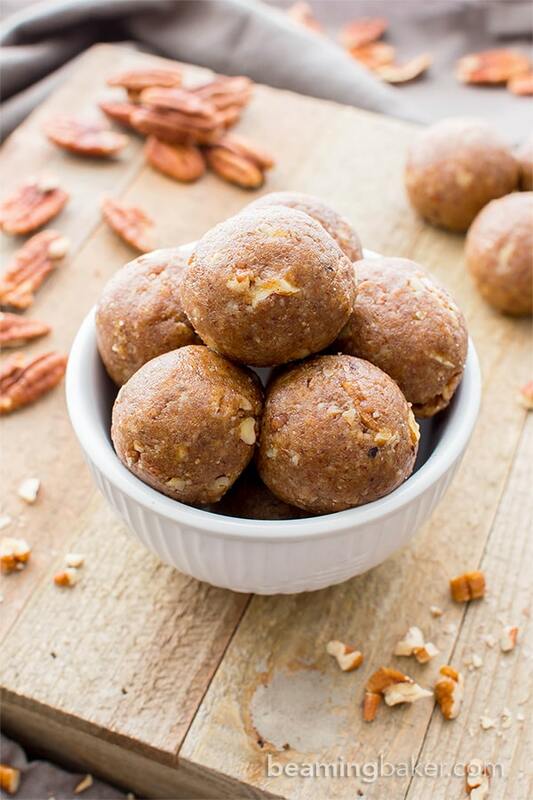 As for those of you who could care less about floating elements in a recipe, I know you’ll just love that these pecan pie bites are made with so few ingredients. 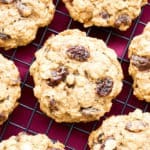 They’re incredibly tasty—sweet, lightly salty and over-the-top satisfying, with lovely bits of pecans in every bite. And, if you’re in the mood for some warm, delicious, pie-shaped pie (!! ), you have to try this Cranberry Maple Apple Crumb Pie from Healthy Seasonal Recipes. So many fantastic fall flavors! Be sure to swap the butter for dairy-free butter to make it vegan. And until Erik releases his signup sheet, and until I somehow manage to make him that entire pecan shortbread village made up of pecan people with pecan hats, let’s all enjoy this crazy good treat. Also, while you’re at it, you’ve got to check out my crazy-talented friend Erin’s Vegan Key Lime Pie on Texanerin. Can you believe it’s paleo too? ???? P.S. Do you love that this is fruit-sweetened only? 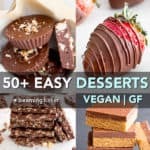 I’ve been thinking about whipping up treats like this for a long time now (plus my friend Natalie is such as genius with them), and I think this is a great start. I truly hope you love them as much as my family and I do. I can’t wait to hear what you think! In the meantime, tell me, what are you favorite ways to enjoy pecans? Add dates and almond butter to a food processor. Blend until you get a somewhat cohesive, sticky and crumbly mixture, like chunks of wet sand. This will take about a minute. Scrape down the sides of the processor as needed. Add in remaining ½ cup pecans. Pulse a few times until incorporated and pecans are chopped, with medium-small pieces still visible. Pour this mixture into a medium bowl. Press down on the mixture until it's tightly packed and resembles dough. Scoop about 2 tablespoons of the mixture into your hands. Roll and press into balls. I made about 15 bites. Enjoy! Storing notes below. -*Be careful not to over-process, as the bites will become too oily. - Storage notes: Store in an airtight container at room temperature for 1 week. - Storing in the refrigerator: Store in an airtight container in the refrigerator for 1-2 weeks. 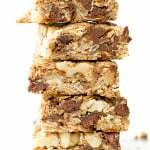 - Fall recipes (v, gf, df): pumpkin bread, double chocolate pecan brownies, pumpkin chocolate chip muffins. 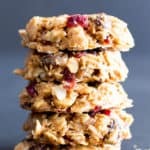 - More No Bake Bites (all V, GF, DF): cranberry coconut, pumpkin chocolate chip cookie dough (paleo), peanut butter coconut, peanut butter chocolate chip cookie dough. 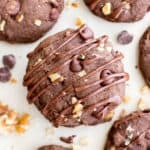 Pecan Lovers, unite! I’ve got something special for you: try my Double Chocolate Pecan Brownies (Vegan, Gluten Free, Dairy Free). 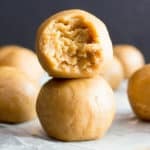 Just something spectacular to add to your No Bake repertoire: try my No Bake Pumpkin Chocolate Chip Cookie Dough Bites (Paleo, Vegan, Gluten Free, Dairy Free). No bake awesomeness. 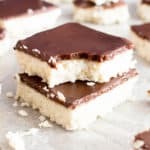 Yep, homemade paleo candy looks THIS good: try my Paleo Almond Joy (Paleo, Vegan, Gluten Free, Dairy Free). Just 5 ingredients to your very own homemade candy bliss. I love love love pecan pie but it never makes the list of pies that I get to make for Thanksgiving /Christmas because I’m the only one who loves it. So I’ll just make these and horde them to myself. I wish I were frolicking off to the beach! And also that there were 7 of me. In pecan hats. Haha 🙂 But also that I had a few of these to power me through the rest of this crazy Thursday! Bite form will definitely do the trick! 🙂 So interesting about the pecan pie! Lovely bites Demeter. It’s so tempting and I feel like gobbling up every one of those pieces that I see there. Pinning!!! I think my hubby and Erik would be such a great friends. They both have funny-strange-crazy-sometimes scary ideas Hahah 😀 Glad you got Erik to eat nuts. 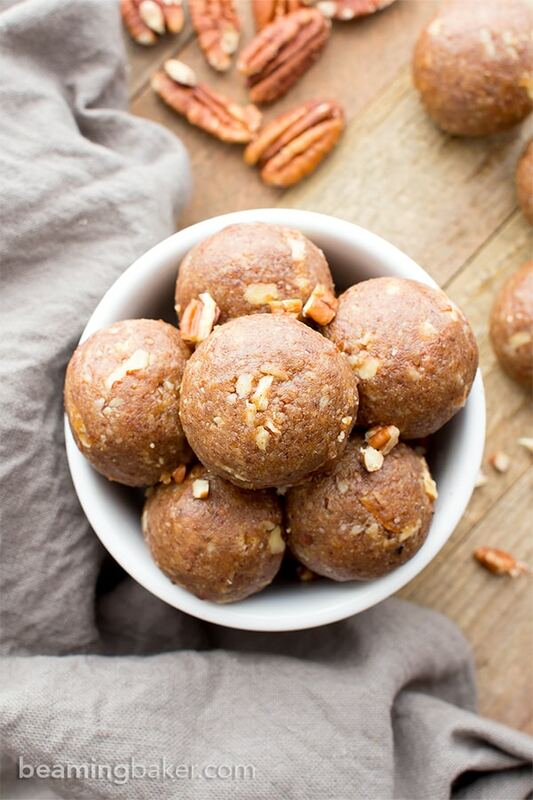 Nuts are super healthy woohoo 😉 Demeter, I looveee these mini pecan pie bites <3 They look so soft textured and I bet they taste nutty, sweet and just perfect. Yum! I am a huge pecan fan. Love their natural sweetness. great little bites to have around the holidays. Sharing everywhere! Yeah! Maybe you can both share a nice big batch, regardless of your geographical origins. Lolol. 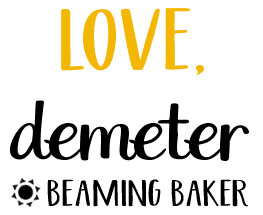 You make the BEST energy bites, Demeter! 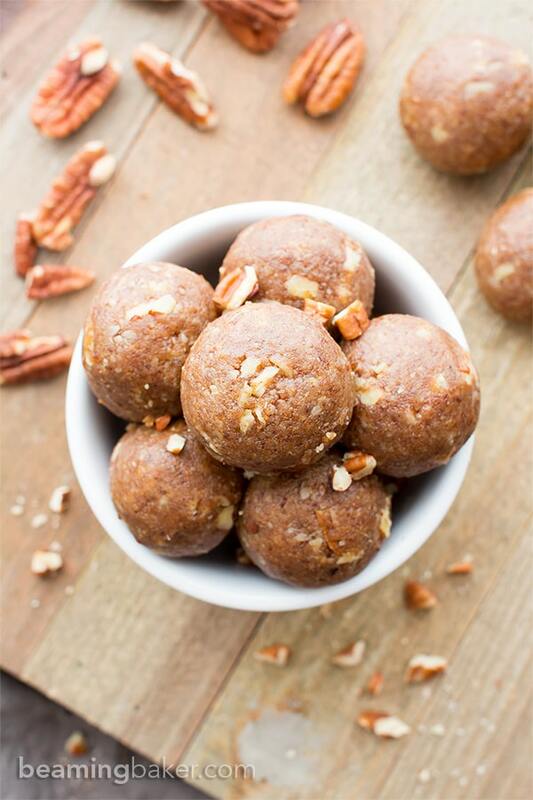 I love that you made these with pecans. 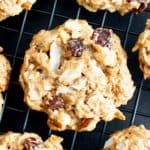 They’re one of my favorite nuts, and clearly, not just for baking! But those pecan brownies…I NEED to make those for my husband, as he would go “PECANS” over them, haha! 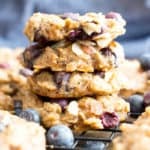 🙂 These energy bites are just what I need for this Monday morning. Pinned of course! Hope your week is off to a great start! Aw, thanks so much Gayle! 🙂 So clearly not just for baking! Hehe. He would go pecans over them? Lololol. Love it, G! Thank you for pinning my friend! Hope you have an awesome start to the week, too! Hi Demeter! I just made a half batch of these – & – oh my! So delicious 🙂 Thanks for the great recipe!